David Pierpont Gardner was president of one of the world's most distinguished centers of higher learning―the nine-campus University of California―from 1983 to 1992. In this remarkably candid and lively memoir he provides an insider's account of what it was like for a very private, reflective man to live an extremely public life as leader of one of the most complex and controversial institutions in the country. Earning My Degree is a portrait of uncommon leadership and courage and a chronicle of how these traits shaped a treasured, and sometimes mystifying, American institution. Before his tenure as president, Gardner spent seven years at the University of California, Santa Barbara, during a tumultuous era of culture wars, ethnic division, and anti–Vietnam War protests, leaving his post as vice chancellor to serve as vice president of the University of California from 1971 to 1973. In 1973 he was named president of the University of Utah, and while there he chaired the National Commission on Excellence in High Education, which authored A Nation at Risk, regarded today as the twentieth century's most telling report on the condition of American public schools. As president of the University of California, he contended with intense controversies over affirmative action, animal rights, AIDS research, weapons labs, divestment in South Africa, and much more. This memoir recounts his experiences with these and other issues and describes his dealings with the diverse cast of characters who influence the university: U.S. presidents, governors, legislators, regents, chancellors, faculty, staff, students, alumni, and donors. 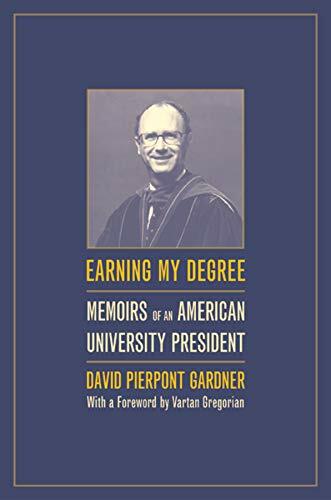 The epilogue of Earning My Degree is a thoughtful and engaging account of the ten years since Gardner's retirement that includes his personal views about what has truly mattered in his life.